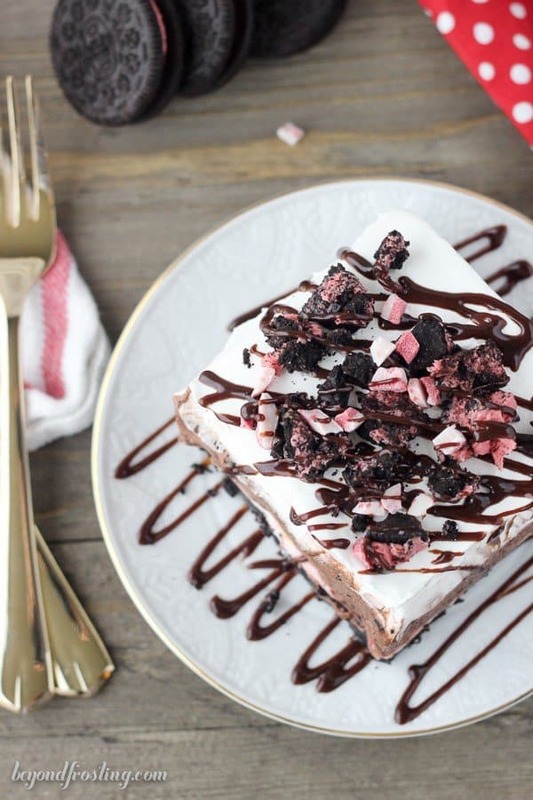 This Peppermint Oreo Lush is a No-Bake layered Icebox Cake. 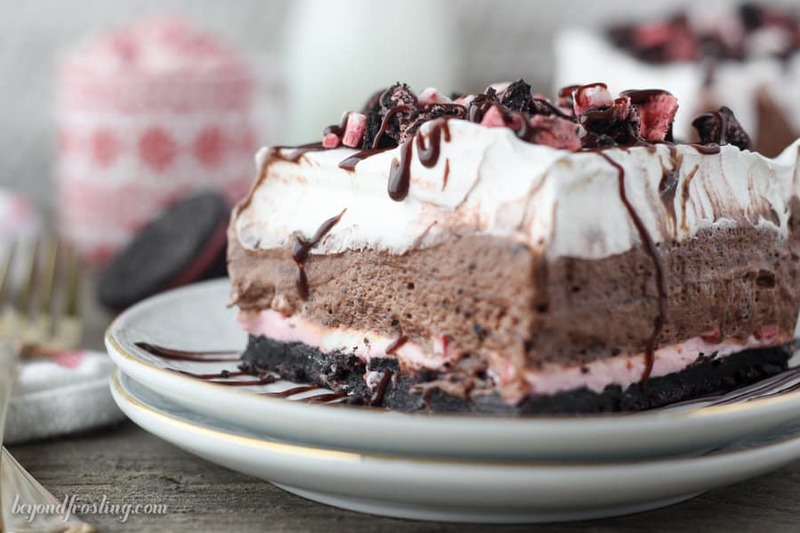 The crust is made with Peppermint Oreo, followed by a no-bake peppermint cheesecake, a chocolate mousse and it’s finished with whipped cream. The Monday after a holiday is so rough. I spent every last moment savoring my time on Sunday, and the countdown is officially on until Christmas break. Who’s with me? If you’re looking at the term “lush” and thinking about those extra couple cups of holiday punch you saw your friend drink, then we’re not talking about the same kind of lush. I’m talking about a dessert that so lush-ious that it’s almost too good to share. 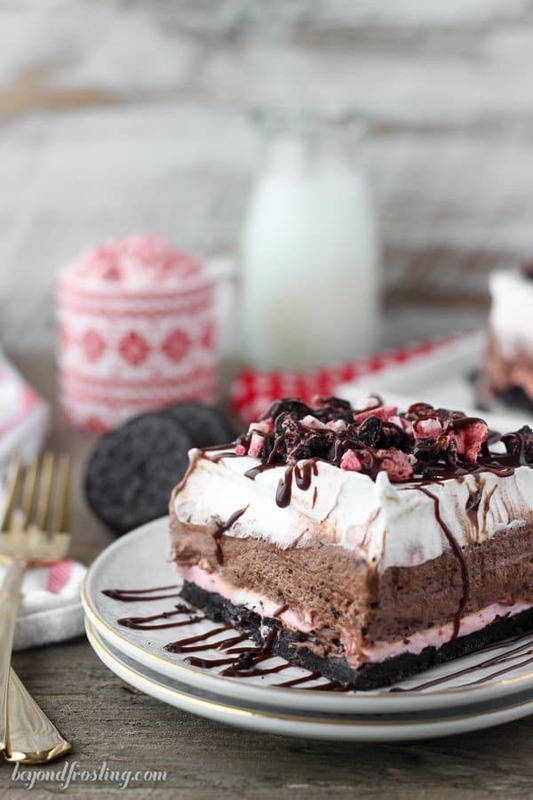 Dessert Lush is also known as lasagna or could even be called an icebox cake. If you’re a peppermint fan, then look no further. This layered No-Bake Peppermint Oreo Lush is another no-bake dessert that will free up some time in your kitchen this holiday season. This is a “make-it-and-forget-it” type of dessert so you’re not stressing over what to serve. 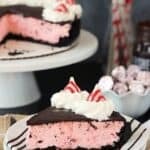 It starts with a layer of Peppermint Oreos on the bottom forming the crust. 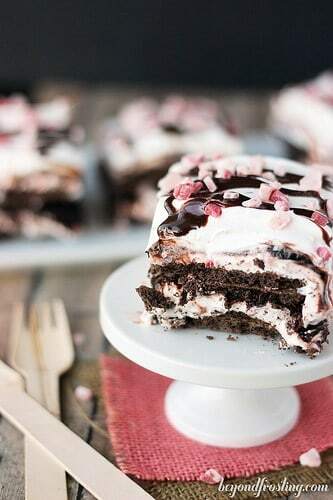 Then there’s a layer of peppermint cheesecake, followed by some chocolate mousse and a layer of whipped cream on top. 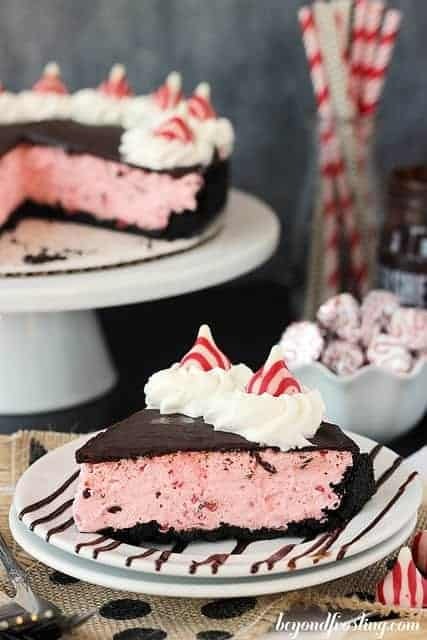 Peppermint and chocolate is one of my favorite combinations. Better yet, my boyfriend doesn’t like peppermint and that means more for me. You don’t need any special equipment for this dessert, just a 9-inch pan and a mixer of some sort. If you don’t have a mixer, you can do this by hand, but you’ll want to wait until the cream cheese is completely at room temperature so it’s easy to work with. 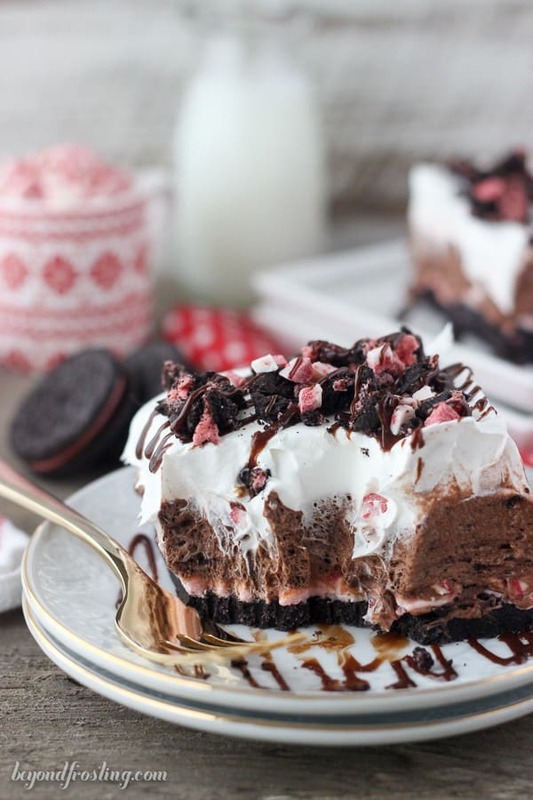 Make your crust with some Peppermint Oreos and butter. The package of Peppermint Oreos is smaller than the regular bags of Oreos, so make sure you grab two. I used about a bag and a half for the crust and sprinkled the extras on top. The great thing about these types of desserts is that you can totally customize them to YOUR favorites. For instance, you could make a vanilla or white chocolate pudding instead of regular chocolate. If you don’t love Cool Whip; I get it. Just make homemade whipped cream! The one thing I would suggest is that when working with peppermint extract, tread lightly. The flavor can go from wonderful to toothpaste very quickly and no one like eating toothpaste on purpose. If you want to kick it up a notch, consider adding some peppermint schnapps to the pudding or something like that. You guys know I love a good boozy dessert. For the peppermint candies, I prefer to use Andes Peppermint Crunch, which you can usually find in the baking section. Be sure to check the holiday baking displays that you usually find during this time of year. Don’t let the holidays stress you out, we’ll get through it together, with a second serving of this Peppermint Lush. For the crust: Grind all but 5 cookies into a fine crumb using a food processor or blender. Set the last 5 cookies aside to garnish the dessert. In a small bowl, melt the butter in the microwave for 30 to 45 seconds. Pour the melted butter over the cookie crumbs and stir until the crumbs are well coated. Press into a 9-inch square pan. Refrigerate this while you are preparing the filling. For the cream cheese layer: Soften the cream cheese in the microwave by removing the wrapper and place the cream cheese on a plate. Microwave for 15 to 20 seconds. In your mixing bowl, beat the cream cheese on medium-high speed for 2 to 3 minutes. Proceed to add the granulated sugar and continue beating for another 2 to 3 minutes beating until the sugar is well incorporated, scraping down the bowl as needed. 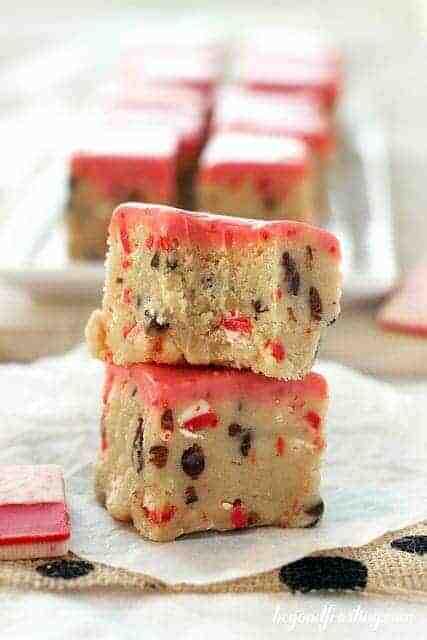 Add the heavy whipping cream, peppermint extract and red food coloring. Mix until all ingredients are well blended. Fold in Andes Peppermint Crunch. Spread the thin layer of cheesecake over the Oreo crust. For the pudding layer: In a small bowl, combine the instant chocolate pudding with the milk and whisk until the powder mixture is dissolved. Refrigerate the pudding until firm, about 10 minutes. Place metal mixing bowl in the freezer to chill. Place 1 tablespoon of cold water in a small dish. Sprinkle the gelatin over the cold water, trying to spread the powder evenly. Allow the gelatin to turn to a solid (about 2-3 minutes). Microwave for 10 seconds until the gelatin turns back to liquid. Pour the heavy whipping cream into the chilled bowl and use an electric mixer to beat the heavy cream on medium-high speed until the cream gets bubbly. Slowly drizzle in the liquid gelatin. Once the whipped cream starts to thicken, add the powdered sugar and continue beating on high speed until stiff peaks form. Fold the prepared whipped cream into the pudding until well combined and spread over the cheesecake layer. For the topping: Thaw a container of Cool Whip and spread over top or prepare a second bath of whipped cream following the instructions above. Refrigerate this dessert for 4-6 hours, but overnight is best. Garnish with hot fudge and sprinkle with additional Andres mints and crushed Oreos. 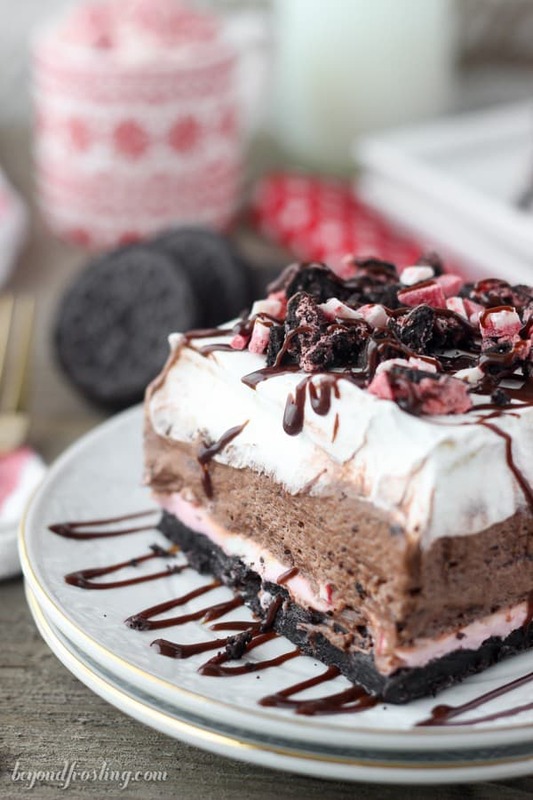 Making your Peppermint Oreo Lush right now. Stupid question: do you remove the filling from the oreos for the crust? Also, there is no Peppermint Oreos. It is now Mint Oreos (with green filling). Does that matter? Hi Sharon, apologies for the delay, I am off for the holidays. For the future, you do not need to remove the filling from the Oreos! And no worries on the mint Oreos! Sounds yummy to me! which picture are we going for here? im a visual learner 😉 but there seem to be a couple different pictures of the dessert with different thickness levels. thanks! See, my husband LOVES mint and chocolate so I would definitely have to share! Lol. This is absolutely something we’d both go nuts for! I love every ingredient in this. Perfect!!!!!! What a showstopper! Love love love this Julianne! Yum! Let the holidays begin!